Have you ever thought about going to places far far away? A young girl named Ginger Boultinghouse and a boy named Jeremy Johnson Johnson did, and they found out that one of the places called far far away was in their little town of Never Better. 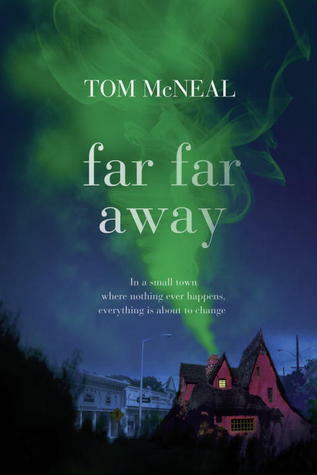 Tom McNeal’s fairy tale Far Far Away becomes one of an unknown fate in the eyes of Jeremy, Ginger and Jacob. Jacob has always protected Jeremy from everything, except when Jeremy needed to be protected. Jacob Grimm is a kind soul that has been dead for over three-hundred years. Ginger Boultinghouse is a lover of danger and outrageous things. And Jeremy Johnson Johnson is cautious of living people because he can hear the dead when he touches his temple. Jacob was very cautious of Ginger because she was much more outgoing and outrageous than Jeremy, but she still took interest in him. The story is set in the summer the small town of Never Better. In Never Better it can sometimes be unusually cloudy or cool, but fortunately for Ginger the sun rises early and sets later so it is perfect for her pranks at night. She loved doing little stunts with her friends. First, she enlists him in a prank on the town’s baker, then she climbs up to his room and accidentally spends the night. Soon, they are the talk of the entire town and suddenly blacklisted. However Ginger keeps on seeking Jeremy out so she can spend time with him. “It was as Ginger’s grandfather had said. It did not matter how far you go, you always take yourself with you.” Ginger still wants to go far far away, that’s why no one became scared when she doesn’t show up with Jeremy for a few days, but to tell the reader who stopped them from coming home would spoil the book so please read Far Far Away to find out. Far Far Away was a great novel for tween readers who enjoy mysteries that unfolds with each turning page. It is a good read that pulls you in and shows how to figure out the clues of this mysterious novel. Although I would not call it a mystery, it has characters with undecided fates and and others who are not who they seem. Many lie, some believe. The truth will be revealed but, does it end in happily ever after? Read to find out who comes out on top.